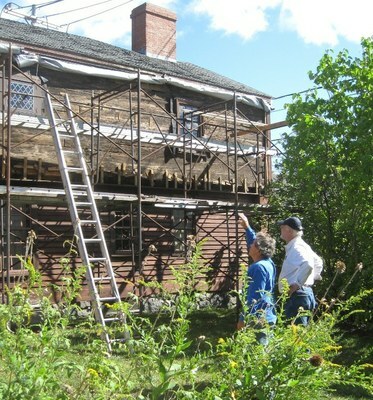 Historic New England’s carpenters are investigating structural distress at the c. 1709 Gilman Garrison House in Exeter, New Hampshire. Severe cracking in the interior plaster suggested that the south-facing wall was bulging, or bowing, outwards, a potential sign of a displaced structural element or a too-heavy roof load. Carpenters removed the exterior wood cladding to review the conditions of the original rough-sawn log structure. Historic New England retained an engineering consultant to further review this area, provide commentary on its condition, and make recommendations. We decided to institute a structural monitoring program to determine how much, if at all, the building was moving. Measurements of the vertical movements: We established eight fixed points in the ceiling to determine vertical movements of the attic/roof structure. This data will assist in recording any attic or roof vertical settlements related to the rear wall bowing. Measurements of the bowing rear wall: Three steel-wire plumb lines were installed at the ends and center of the rear wall. We then took offset measurements from each line to the center of each rough-sawn plank in the wall. Tracking these offsets will assist in determining further bowing and its rate of progression, if any. Crack monitors: Our directional movement recording gauges were installed on the exterior of the building along the connections of the planks. These measurements will assist in determining the curvature of the wall and subsequent progress, if any. The initial measurements were recorded in December 2011. Three additional readings will be completed in the spring, summer, and fall of 2012 to determine any movement of the wall and the need for repairs. Depending on the results, we will develop a plan for either stabilization or structural repair. This work is in conjunction with the long-term master plan for Gilman Garrison House, which includes roof replacement, cladding repair, and repainting. Support preservation projects at our historic properties with a gift to the Preservation Maintenance Fund.